The first shoe to drop in the sordid (and wonderfully cinematic) tale of graft and corruption in the Congress was Michael Scanlon, Jack Abramoff’s sometimes business partner, occasional bagman and all-around useful guy. Mostly Indian casino shell-games it would seem, but the footprints of a useful guy can point almost any direction. Hey, who knew you could go to jail for this stuff? Not me. Kerplunk (the sound of a size 10 wingtip hitting the grand jury floor). As regularly as “The Twelve Days of Christmas,” first one, then another of this cast of motley characters copped a plea. No Partridge in a Pear Tree as yet, but who knows? The next shoe to fall, name of Adam Kidan, was Abramoff’s partner in a neat little scheme to buy SunCruz Casino, a kind of floating crap-game. The inspiration for that particular venture into the world of nautical roulette must have been Abramoff’s and Scanlon’s fleecing of Indian casino operations. Kerplunk #2. One guy who isn’t able to cop a plea (and thus become a shoe) is Gus Boulis. Gus is the guy Jack and Adam bought SunCruz from, if you can call bad checks and non-existent loans ‘buying.’ Gus would probably have been the most highly motivated of the bunch to plea instead of what he had to settle for. But Gus dropped in a different and much more permanent way, shot, gangland style. Interestingly, two of the three hit-men picked up for that piece of bungled assassination have business ties to Adam Kidan. Business ties? A euphemism, no doubt. But it makes Kidan’s plea all the more interesting. The three mob goofballs will absolutely make their bargains to tell all, kerplunk, kerplunk, kerplunk. But the guy speculated upon to be the next piece of footwear to hit the deck is Jack himself. At the moment, Jack Abramoff is ground zero for the ugliest and most wide-ranging bribery scandal to hit the Congress in . . . decades? . . . years? Certainly since ABSCAM, the 1980s FBI sting operation that ended a bunch of political careers and proved that the lesson taught to an embarrassed legislature wouldn’t last twenty years. One Senator and four Representatives took the fall on that one, but this could top ABSCAM by a factor of ten. Everyone is nervous. Shoe #7 (in case you’re keeping count) could well be David Safavian. David is (or was until he was arrested at his home) head of the Office of Federal Procurement Policy within the Office of Managment and Budget. David was trained at the lobbying firm of Preston Gates by none other than Jack Abramoff. David’s steady and profitable rise through the Washington bureaucracy is said to have been mentored by Jack, who pushed the right button, fiddled the correct dial and quo'd the proper quid on his behalf. Safavian scratched when Jack itched, but don’t look for him to go to prison for it. A serious stumble in a young career isn't the same as ten years in the slammer. The rule for copping a plea (as they so colorfully call it on TV) is you must have something to trade that is bigger than your personally indictable self-interest. Bob Ney, the somewhat clumsy taker-of-favors who occasionally represents the interests of Ohioans (when they don’t conflict with his own) is not that large a fish. He is merely the first to fall, a sort of test-case, a non-keeper thrown back to the voters to judge their mood. "Look, I don't take this lightly," Ney told the AP. "I have not changed my stripes. I'm doing my job. I commute back home. I go out around the district. Nothing has changed for me." Sure, Bob. One stroke penalty for improving your lie. There’s only one fish as big as Abramoff in this whole scenario and that’s The Exterminator, Tom DeLay. I would suggest that the very least of Tom’s troubles-yet-to-come are his indictments in Texas. 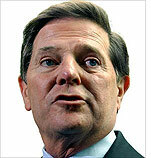 Tom DeLay is the engine that made Jack Abramoff, Michael Scanlon and David Safavian. Guys like those three have always walked the halls of power, dispensing what they could find a market for, but Tom professionalized it, institutionalized the quid pro quo between business and government.The best government money can buy named its price under the stewardship of Tom DeLay and the phrase everybody does it became the currency of shame in Washington as a result. Frantically, bunches of Congressmen and Senators who partook of the largesse are returning campaign contributions from Abramoff and his clients. Huffing and puffing with huffery and puffery, they are uniformly outraged, calling him a fraud and a crook. Conrad Burns of Montana is typical, hastily returning $150,000 in campaign contributions and stating for the record, "This Abramoff guy is a bad guy. I hope he goes to jail and we never see him again. I wish he'd never been born, to be right honest with you." To be right honest? A little late for that, Conrad, but I surely do understand that you wish he’d never been born. Now of course, the citizens of Montana have to figure out what to make of how Conrad defines both right and honest. And so the full Congress and Senate will be judged by the same terms, and be found lacking. Lacking a Senator here and a Representative there after the mid-term elections, for which we have to thank both Jack and Tom.